Explore the stunning beaches and beautiful towns along Oregon’s northern coast on this full-day trip from Eugene. Visit the charming towns of Yachats and Florence, browse antique shops and art galleries, and stop several beaches to maximize your time at the Oregon Coast! A visit to the Central Oregon Coast is one of the most scenic and dramatic stretches of coastal highway 101. Blessed with sandy beaches, massive headlands, picturesque lighthouses and charming coastal villages, you will experience it all with numerous stops to take it all in! After pickup from your Eugene hotel in the morning, travel by Sprinter Van to the Sea Lion Caves which is a privately owned wildlife preserve and bird sanctuary (since 1932) centrally located just 11 miles north of Florence on the beautiful and rugged Oregon Coast. 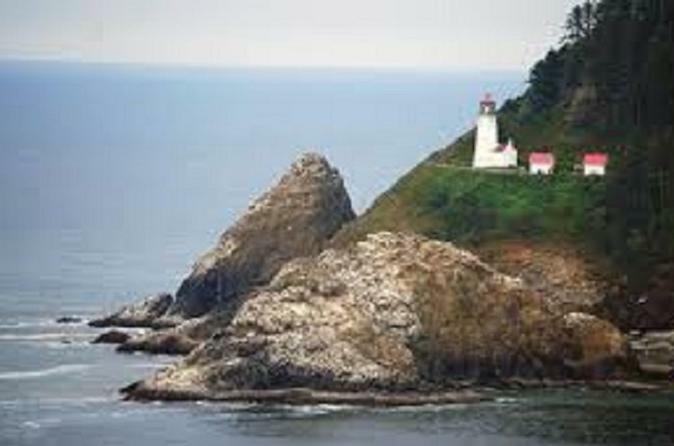 We will also stop at Heceta Head Lighthouse this is a working lighthouse. From a height of 205 feet above the ocean, its “first order” Fresnel lens, casts it’s beams some 21 miles out to sea. It is the brightest light on the Oregon coast. It is said to be the most photographed lighthouse in the United States. You will have the option to walk the short 1/2 mile trail (150 feet gain) up to the lighthouse, walk on the beach, walk under the Historic McCullough Cape Creek Bridge, or just sit and listen to the rhythmic waves and take in the sea mist of the Pacific Ocean. Next we will visit Yachats where you will have several dining options to enjoy lunch along with galleries, boutiques and coffee shops or maybe a little ice cream is in order! If seafood is what you came for, it does not get any fresher from several local restaurants purchasing from local fishermen taking pride in the catch of the day. Finally we will visit Florence and the Historic Old Town district of this inland coastal village originally built on docks lining the Siuslaw river banks. With Florence’s long time logging and fishing history, it was positioned perfectly between the coastal forest range and the Pacific ocean, taking advantage of the easy river access. Florence and the Siuslaw river is the Northern border of the Oregon Dunes National Recreation Area spanning 40 miles (60 km) south along the Pacific with dunes as high as 500 feet (150 m). The Oregon Dunes are a unique area of windswept sand that is the result of millions of years of wind and rain erosion on the Oregon Coast. These are the largest expanse of coastal sand dunes in North America. The dunes provide numerous recreational opportunities including off-road vehicle use, hiking, photography, fishing, canoeing, horseback riding, and camping.